The Holy Land: Did You Know? THE WAY OF THE CROSS. Only in the Holy Land can you celebrate Jesus’ death and resurrection in the place where it happened. The fourth-century pilgrim Egeria described the Holy Week services in Jerusalem: “What I admire and value most is that all the hymns and antiphons and readings, and all the prayers that the bishops say, are always relevant to the day which is being observed and to the place in which they are used.” Today, much like in Egeria’s era, thousands of Christians observe Good Friday by following the “Via Dolorosa”—the traditional route Jesus walked on the way to his crucifixion—from the Mount of Olives to the Church of the Holy Sepulchre. The route and rituals have changed over the centuries, but the devotion has not. Jerusalem Christians’ celebration of Easter influenced Christian worship around the world. The practice of following the “stations of the cross” is one example. HERITAGE IN COLORED STONE. 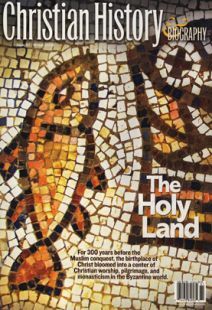 One of the most lasting and beautiful legacies we have of early Christian communities in Palestine and the surrounding region are mosaic floors. This cross is in a very early church in Mamshit, a city of the Nabateans, an ancient kingdom of traders in the Negev desert who converted to Christianity in the fourth century. OUR LAND. The first Christian writer to mention the term “holy land” was Justin Martyr in his Dialogue with Trypho (c. 160). Justin was trying to show that the land God promised to Abraham would be inherited by Christians when Christ returned and built a new Jerusalem. But according to Robert Louis Wilken, it was the monks living in the Judean desert who claimed this concept as a present, Christian reality. Sixth-century monastic leaders Theodosius and Sabas wrote to the Byzantine emperor calling themselves “the inhabitants of this Holy Land”—meaning not just a collection of pilgrimage sites but a region with spiritual privileges and a living church. Monasticism played a crucial role in Palestine, and Sabas’s monastery is still an active Christian community today. TO GO OR NOT TO GO? Is there really something “special” about the land of the Bible? Christians have debated this since the earliest centuries of the church. Cyril, the bishop of Jerusalem (c. 348–387), spoke for many when he proudly claimed, “Others only hear, but we both see and touch.” Biblical scholar Jerome, who settled in Bethlehem in the 380s, believed that visiting the historical sites can help us understand Scripture better. But he also warned, “It is not being in Jerusalem, but living a good life there that is praiseworthy.” Gregory of Nyssa, less enthusiastic about the growing popularity of pilgrimages, assured his congregation that God was just as present with them in Cappadocia as in Jerusalem. BRINGING JERUSALEM HOME. Modern street vendors didn’t invent the souvenir industry. When Byzantine pilgrims returned from Palestine, they brought back relics, oil from lamps above Christ’s tomb, and many other tangible reminders of their visit. Some even tried to recreate the Holy Land in their own hometowns. Santa Stefano in Bologna, Italy, was originally a complex of seven churches representing the Church of the Holy Sepulchre and other key holy sites in Jerusalem. A DWINDLING WITNESS. No church in the world can claim more ancient roots than in Israel-Palestine, where there has been a continual Christian presence since the time of Christ. But in the last 60 years, the number of Palestinian Christians living in the area has dropped from as much as 40 percent of the population to only 2 or 3 percent (estimates vary), while most Palestinian Christians have emigrated elsewhere. The reasons are debated—various groups blame Israel’s policies or pressures from the Muslim majority. In 1992 George Carey, then Archbishop of Canterbury, told the New York Times that he feared in 15 years Jerusalem and Bethlehem would become “a kind of Walt Disney Christian theme park”—a tourist attraction without a real Christian presence. His prediction is in danger of coming true. But those local Christians who still remain in places like Bethlehem are holding on to their homeland and heritage fiercely.